In today’s networks, WAN redundancy is very important even in small networks. To have a truly redundant WAN connectivity, you must use two different ISP connections. However, there is a catch here. You need to use BGP dynamic routing protocol (usually), which adds some complexity and extra requirements. In most cases, you will need two dedicated IPv4 network subnets. The biggest problem you will encounter is that IPv4 addresses have been depleted since 31 January 2011 and the few blocks available for sale are very expensive. However, there is an alternative and cheaper solution. If you don’t require a whole public subnet, you can have primary and backup WAN connections and use NAT for both links with automatic fail over. This scenario however will work only for networks having outbound traffic (i.e only traffic from inside LAN towards the Internet). In the following example I will show you such a connection topology that will prove useful in many network scenarios. Note: You can still use a BGP connection with each of the providers announcing a default route, but usually it comes with a fee. In this topology we will use two floating static default routes. 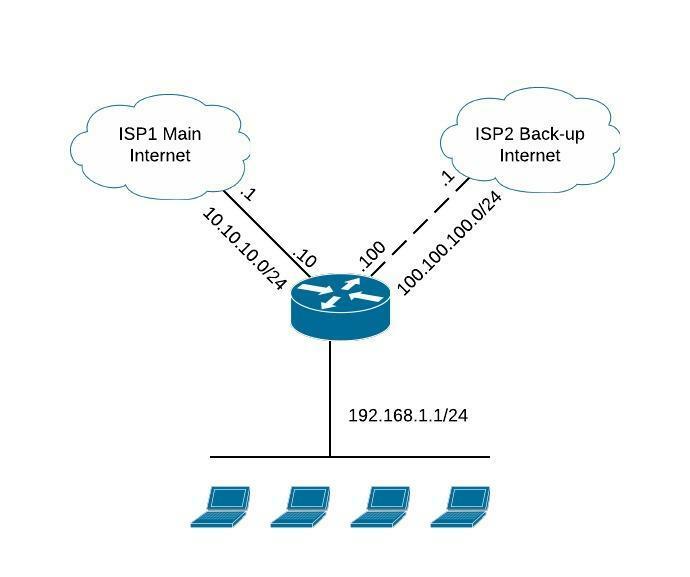 In the diagram below, we have two WAN connections (ISP1 main connection and ISP2 Backup connection). We just need to provide Internet access for the internal LAN subnet. As long as track 1 object is Up, the first route will be installed in the routing table. If track 1 changes state to down then the route will be removed from the routing table (floating route) and the second default route with metric 30 will be installed in the routing table. This a simple, cheap and easy method to have automatic fail over for your internet connection. For more reading on failover and redundancy examples, see this is post here for HSRP with object tracking. Thank you for the awesome tutorial, I have setup something like this a few times. I have always used a static route for the tracked IP to prevent flapping. I like the idea of specifying the source interface under ip sla though. Hi Andrea, great article, is there is any way were we can download the article in a pdf format? if not, can you please add the option to all of your articles ? Thanks for your comment and feedback Ali. Currently I don’t have the option to download the article as PDF. I will look into it and maybe implement it in new articles. hello, thx u for this tutorial. with this scenario what will happen for VPNs? NAT? do they need duplicate for another second backup ip? This scenario works well only for outgoing traffic. If you have incoming traffic (i.e traffic initiated from Internet and you have VPN or webserver hosted on your network) then you need other redundancy options like BGP, Load Balancer etc.